Obama gave a whale of a speech tonight. I have written about his campaign in a visual culture context before. Specifically, I’ve discussed his campaign in the context of the supposedly reactionary career of Norman Rockwell. 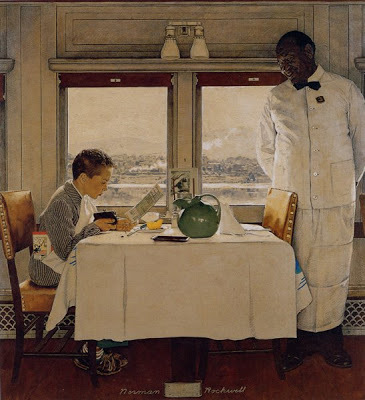 Rockwell’s politics were substantially left of what others imagined. He was a Dickensian, but his work included no Uriah Heeps or Ebeneezer Scrooges. Rockwell’s missing bad guys took the edge off his apparent politics. All who remained were the good folks whose loneliness on the moral stage seemed to endorse the mendacity of the missing bad guys. Obama’s citations of regular Janes and Joes reminded me of nothing if not Rockwell’s noble everyman, the Freedom of Speech man. Arrgh! Chris Matthews is now saluting Jesse Jackson as a fabulously generous person despite the latter’s [imagined] off-air comment that he’d like to cut the Democratic nominee’s “nuts off.” That is truly embarrassing. Where is the question about the castration now, in the triumphalist moment? No doubt negotiated beforehand. Rockwell was prevented from including blacks in different roles in his illustration by Post editor George Lorimer and his successors. So we got images of the type above. By the way, purely on art-production terms, it is interesting to note that the tablecloth on thePorter image has been rendered in graphite. There is no paint on the canvas in that rather large passage. The guy knew production methods. Let us rejoice as a country tonight that such a person—such an accomplishment!—as Barack Obama, presidential nominee, is now possible. Assuming He’s not playing canasta on the celestial plane or otherwise occupied, may God Bless America!